According to a group investigating the impact of fast fashion in the United Kingdom, The Commons Environmental Audit Committee, in the UK alone, 235 million items of clothing were sent to landfill last year. The same group says 1.2 billion tonnes of carbon emissions were produced by the global fashion industry in 2015 in the process of textile production – more than international flights and maritime shipping. While those figures are sobering in themselves, it is not only the impact on our environment that the fashion industry has to answer for; it is the impact on the people and their wider communities who produce the clothes in less than desirable conditions around the world. “Every single item you buy impacts the life of a person somewhere in the world,” Justice Denim founder Deb Schultz says. “Fashion, by and large, is made by women, the majority of whom do not make enough to live on, keeping them trapped in poverty. “In Bangladesh, for example, garment workers are paid as little as 39 cents an hour; in Vietnam, it’s 64 cents per hour. This just isn’t enough to live on,” Deb says. After leaving a career as a fashion stylist, Deb launched her brand Justice Denim in September 2018 with the aim of creating positive change in the fashion industry, both in terms of sustainability, and to positively impact women and children around the globe. Justice Denim has partnered with Destiny Rescue, a global charitable organisation that works to rescue children from sexual slavery and offer them the tools to move forward in their lives in a positive manner. This aspect of the ethos behind Justice Denim is something Deb has been passionate about since first hearing about the work Destiny Rescue does, and it goes hand in hand with the aim to create more awareness about the negative impacts on women and children involved in the fashion industry who are often trapped in poverty. “All our garments are made here in Australia so we can ensure every aspect of our business is ethical and sustainable,” Deb says. “Each is handmade here in Melbourne, and our fabric is sourced from an ethically accredited, premium producer in Turkey, Calik. Calik is also a member of the Better Cotton Initiative, an international initiative working towards improving the environmental and social impacts of cotton production. “A lot of the denim we use is made with a recycled cotton mix. Something we’re passionate about is staying away from sandblasting to age the denim,” Deb says. Sandblasting has been a common practice to age denim but its ramifications for those who undertake the process are serious. “The World Health Organisation has confirmed that sandblasting leads to lung fibrosis and emphysema. Silicosis is caused when small particles of silica dust from the sand embed themselves within the lungs, causing shortness of breath, coughing, weakness and weight loss. It’s incurable, and, in its acute form, fatal. “The reality is, there are other, ethical ways of producing distressed denim using lasers, or scraping by hand or machine. 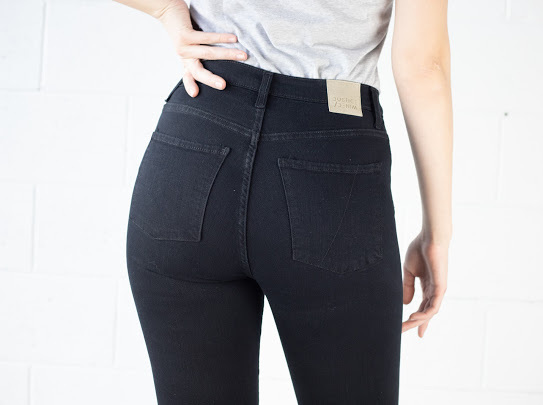 However, even knowing this, consumers have no way of knowing whether they are buying jeans that could have contributed to making a worker ill,” Deb says. In 2013, the Clean Clothes Campaign (CCC) documented its investigation on six denim factories in the South China province of Guangdong, an area responsible for half of the world’s jean production. “Of these six factories, the CCC could only confirm thaof them had completely dropped their use of sandblasting. Three of the factories claimed to have officially banned sandblasting, but interviews of the workers suggested the opposite. “Unfortunately, we, as first world consumers, have got ourselves into the fast-fashion cycle. While we cannot prevent factories from treating their workers the way they do, we can shift our focus to ethical, slow-fashion brands, moving one step closer to making a difference. It’s way past time to think more about the choices we make as consumers. Don’t just get tempted by how great something looks or by the price; think about what has gone into making the item, how long it will last you and where it came from. “As advocates for the slow fashion movement, we place the longevity and quality of our denim pieces at the core of what we do. Through our championship for slow fashion, we believe pieces should not be worn once, and thrown away, but instead, be worn, repaired or upcycled. Clare is an editor and writer whose work has appeared in publications around the world. She completed postgraduate study at the University of Melbourne in 2007 and has since lived and worked in Australia and New Zealand, now dividing her time between Auckland and a tiny house in a rural town in the central North Island.